Two days ago I was walking around pondering if I shouldn’t change into shorts. Then, on Saturday night, the weather went from “mild and calm” to “windy and cold.” We’d been out to shop and grab a bite to eat at a nearby mall. When we left the parking lot the air was still and the temperature an unseasonably warm 65 degrees 1. About half way home we looked ahead and saw a massive cloud of leaves being blown across the road. By the time we pulled into our driveway the leaves were blowing everywhere and the temperature had dropped ten degrees. It hasn’t stopped blowing since. Today the weather is sunny and there are some dynamic clouds in the sky, but it remains as windy as I can remember outside of a storm. 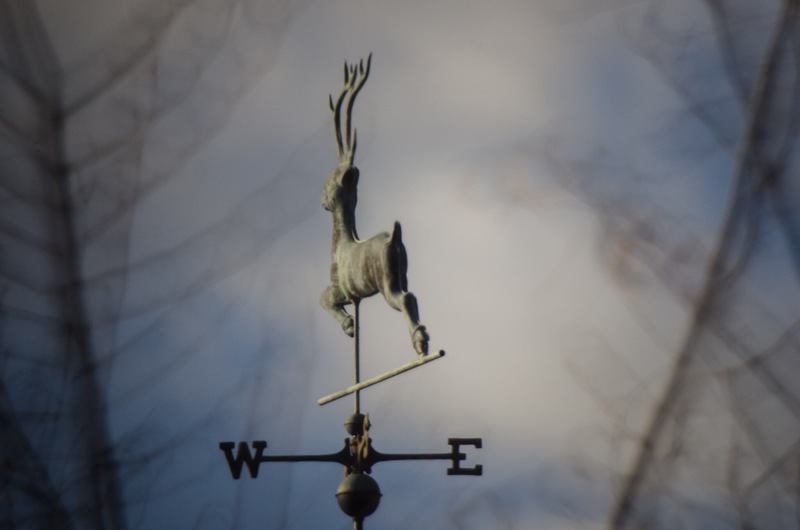 This gave me a great opportunity to practice using my 500mm reflector lens to capture the weathervane across the street. Sadly, before was able to get my remote capture system set up a cloud bank rolled in and the wind moved the indicator to a more severe angle. Still, I was pleased with the results. I’m still growing accustomed to the focus ring on the lens, but I managed to get the image below relatively sharp.